The former Flagler railroad tracks have been turned into the 106-mile paved Overseas Heritage Trail between Key Largo and Key West. This is a unique spot for running, rising above the water with great views the entire way. At pretty much any spot in the Florida Keys, you can hop onto this trail and run a few miles. 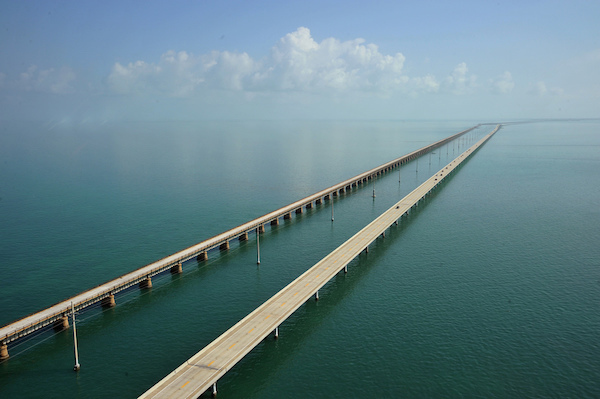 The trail incorporates 23 historic railroad bridges, and includes Everglades National Park, Biscayne National Park, Florida Keys National Marine Sanctuary, The Great White Heron National Wildlife Refuge, Key Deer National Wildlife Refuge, Crocodile Lakes National Wildlife Refuge, Key West National Marine Sanctuary, and 10 state parks. We’ve included a map of the entire trail, as well as a map of some of our favorite segments. Click on each section for a short description. There are mile markers along the trail, which is a good way to plan or map your route. Key West is Mile Marker 0 and Key Largo is Mile Marker 106. Note that this trail is not continuous. 90 of the 106 miles are complete, so there are a few sections where you’ll have to run on the highway, which has a good shoulder but is not that pleasant due to fast-driving cars. Also note that the whole trail is exposed to the elements. Note: As of October 2017, a few sections of the trail are closed due to damage from Hurricane Irma. See here for updates.